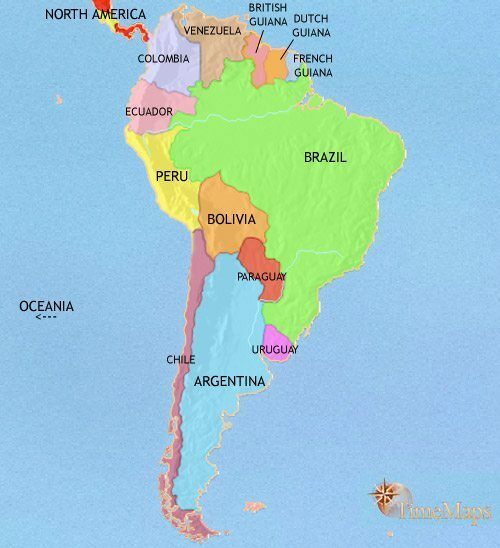 The countries of South America have won their independence from Spain and Portugal. Permanent villages have grown up along coasts and rivers. Large villages are developing along the Pacific coast, with temple-mounds and irrigation systems being constructed. The peoples of the Pacific coast are making strides towards civilization. 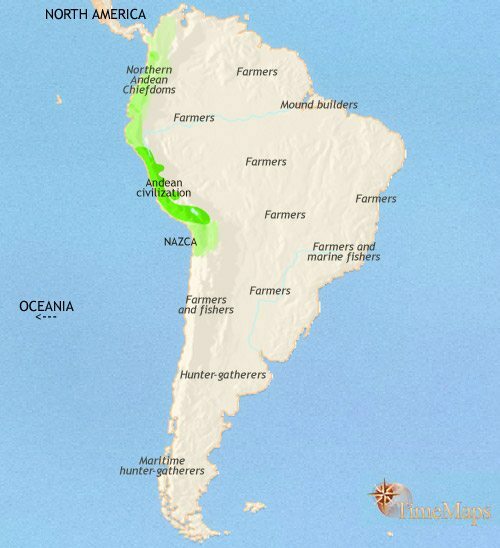 The first civilization in South America is in the making. In the Amazon basin, the Arawak diaspora is in full flood. The spread of maize as a staple crop allows new areas to be settled by farmers. The Moche and Nazca civilizations are now flourishing. The Moche have reached a high level of civilization. Large chiefdoms have emerged in Amazonia. The Tiwanaku and Wari empires now dominate the highlands of Peru. 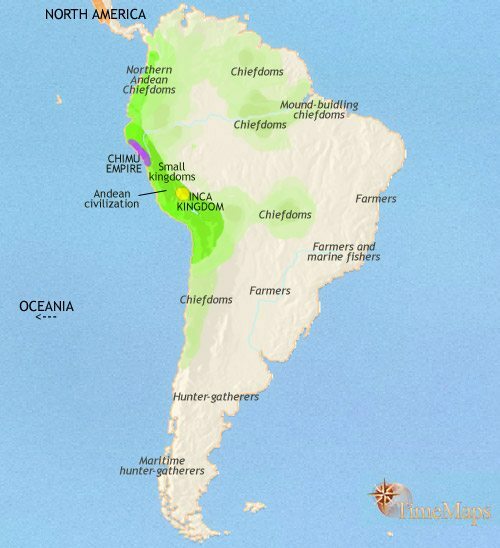 The Chimu empire has appeared on the Pacific coast. The Chimu empire is now the leading state in the Pacific-Andean region. The Inca empire has begun its expansion. 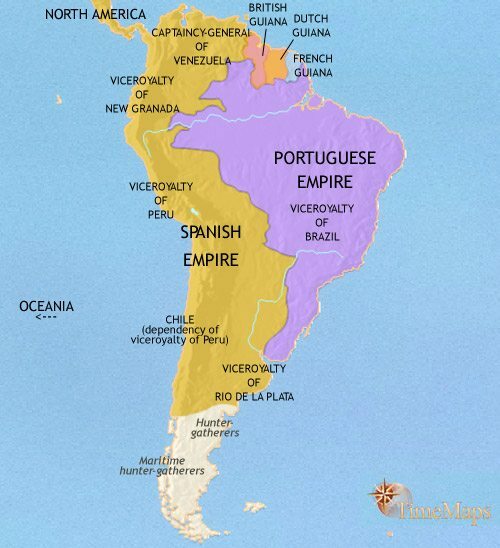 The Spanish and Portuguese now control much of South America. 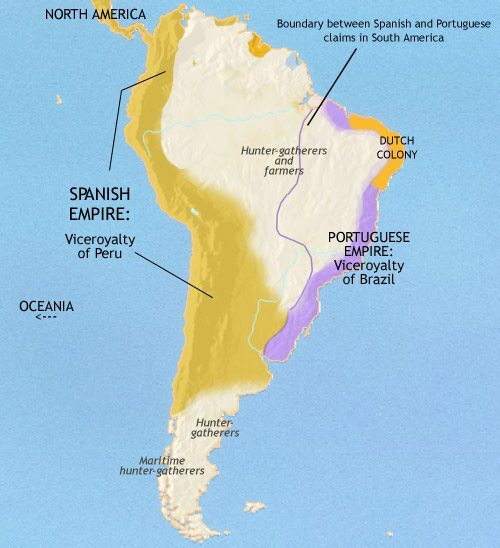 The Spanish and Portuguese empires rule most of South America between them. Foreign investment is pouring into some South American countries. Brazil, Argentina and Chile are growing wealthy. Eva Peron wins the hearts of Argentinians. Many countries of South America have swung, first to dictatorship, and then to democracy. In the late 18th century, several factors – economic rigidities in the Spanish colonial system, lack of political freedom, and the example, first of the American Revolution and then of the French Revolution – created a restive climate amongst the educated classes in South America. Growing calls for independence led to armed revolts breaking out in various regions from 1810. Over the next fifteen years the Spanish colonial presence was driven from all parts of South America, in a process which in some places was marked by no more than a declaration of independence, but in others involved long, hard fighting under charismatic leaders such as Simon Bolivar and Jose de San Martin. With independence won, the challenges facing the new states only just began. Most countries find it hard to develop a stable government, and descend into chaos, out of which emerge strongmen – caudillos – who take over the government. Their power is seldom secure, however, and they have a tendency to fall victim to new strong men who rise to challenge them. The independence of Brazil has come in a dramatically different way to that of the rest of the continent – not through armed struggle but through a separation of one branch of the Portuguese royal family from the other. The peoples of the New World have, by this date, domesticated a much greater range of plants than have those of the Old; however, only in a few areas have food crops become an important part of the economy. 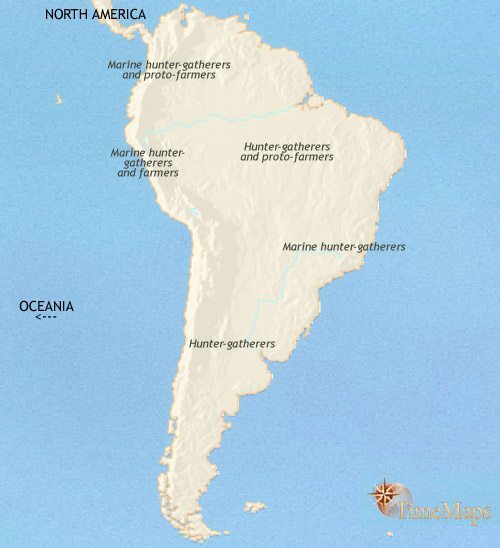 Most of South America is still inhabited by groups of hunter-gatherers. It is only along the coasts of the Pacific and Atlantic, and along the rivers of Amazonia, that permanent villages have become established, benefiting from access to abundant aquatic foods such as fish and shellfish, as well as the more normal land-based animals and plants. The largest and most numerous villages are to be found on the coasts of Peru, Ecuador and Colombia, due to the Pacific Ocean currents here which produce a rich harvest of marine foods. By this date these communities are shifting to a more agricultural economy, and their populations are growing. The inhabitants of some of the larger villages are beginning to construct ceremonial platforms, a feature which will be very prominent in later South American civilization. Over the past thousand years, on the Pacific coast of Peru and Ecuador, improvements in farming have led to increases in population and the spread of permanent farming villages. These developments have been accompanied by the appearance of pottery, the invention of loom weaving and the beginnings of a more class-based society. The largest villages house up to 4000 people. Here, large temple-mounds are starting to be built, evidence for the development of a priestly elite able to control the labour of the rest of the population. This is also apparent in the irrigation systems now being developed. Elsewhere, the shift to farming has been much slower. However, in Amazonia, proto-agricultural villages are beginning to appear, and pottery is spreading throughout the region. Changes are also taking place in the high Andes, where the hunter-gatherer way of life is giving way to llama- and alpaca-herding. 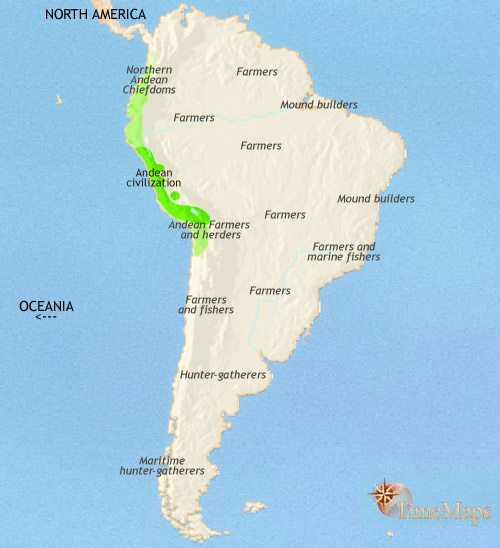 A growing network of trade routes links the high mountain regions with the villages of the Pacific coast. For the past thousand years, the people of the Pacific coast of Peru have been making strides towards true civilization, as larger and more complex societies have begun to emerge. Towns have appeared in the river valleys, dependent upon irrigation farming for their sustenance. The focus of their communal life are the ever-larger temple platforms being constructed in their centres. The trade routes linking these coastal communities with the peoples of the high Andes is transmitting this cultural package into this region as well, so that the two geographical zones are increasingly forming one unified cultural area. Elsewhere in South America, the transition from a mainly hunter-gatherer way of life to one based on farming is gradually taking place, though much of the continent will be home to hunter-gatherers right up until post-Conquest times. At this time the Amazonian basin sees the beginnings of a large-scale expansion of Arawak-speaking peoples from their homeland somewhere in the north-east of the region. This may have been caused by some agricultural innovation, such as the adoption of new root crops, highly suited to forest agriculture, or improvements in their slash-and-burn agricultural practices. In the lowlands of the Atlantic coast, communities are choosing to use refuse middens which have built up over hundreds of years as habitation mounds, as well as for ritual platforms. Over recent centuries the trade networks linking the high Andes and the coastal plains of Peru have been expanding. This is creating a single cultural sphere, and, together with increases in agricultural productivity, is moving it rapidly towards full urban civilization. In the Amazon basin communities of Arawak-speaking peoples continue to disperse over an ever larger area. The fact that these settlements are small, coupled with the rapid evolution of multiple Arawak dialects at this period, suggests that the dispersal is carried out by small groups which, once settled in a particular location, soon send out off-shoots to establish new colonies. This in turn suggests some type of internal “colonizing” dynamic within their culture, such as is found amongst the Polynesians of roughly the same period: here, the founding of new settlements confers royal, semi-divine status upon a leader and his descendants. The settlements on the Atlantic coast built on ancient midden-mounds continue to flourish, and similar mounds start to appear in the central Amazonian river basin, usually (but not always) on a smaller scale than on the coast. Over the past few centuries, in the highlands of Peru, the first urban civilization in South American history has appeared. This is the Chavin civilization. It sees the construction of substantial temple complexes and the production of fine textiles and pottery. In the Amazon basin, the Arawak diaspora continues, and is now beginning to lead to the development of various regional cultures, such as the Saladoid and Barrancoid ceramic cultures which have emerged in the middle Orinoco river plains by this date. The Arawak settlement design will have a long history throughout the Amazon basin. Fortified villages are constructed around large circular plazas; they look much like stockades, and may well have had a clear defensive purpose. The plaza was the natural centre for communal life, and the design of these settlements may hint at the social and military characteristics which gave the Arawak speakers the advantage over their neighbours. The inhabitants were nourished by an agriculture based on manioc as the staple crop. However, the growing of maize in the region has recently begun to spread. Recent centuries have seen the Chavin civilization begin to fragment, giving way to several local cultures in the highlands and coastal plains of Peru. Major settlements are appearing in the central Amazonian basin, evidence that complex regional societies are developing. One major factor in this is the spread of maize in the region. This effectively enables the colonization of the fertile flood plains of the Amazon and its major tributaries. During this period, populations are expanding and hierarchical societies are developing. Settlements extending for several kilometres along river banks are growing up, centres of militarized chiefdoms which organize large workforces to dig canals and build massive defensive earthworks, raise ceremonial platforms and mounds for habitation. 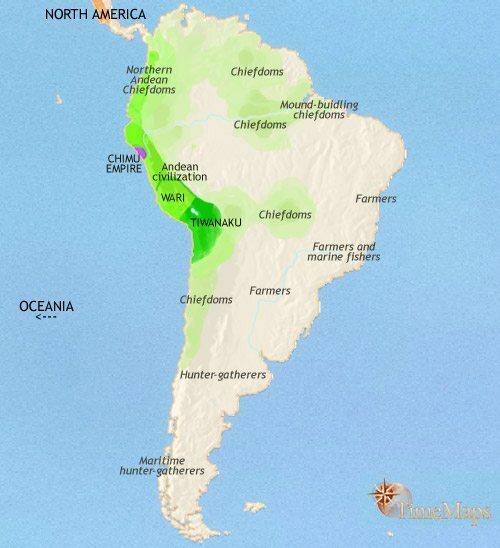 Cultural influences seem to be entering the region from the Andes civilization. Small regional chiefdoms, situated in the forests of Bolivia and Ecuador near to the highland civilization, build earth and stone ceremonial structures. In the north, the Arawak diaspora spills over into the Caribbean. The colonization of much of the Caribbean seems to have occurred relatively quickly between 500 and 200 BCE, leading to the development of those Caribbean chiefdoms which the European explorers would encounter more than a millennium later. Over the past centuries, localized cultures have continued to flourish in various valleys of the high Andes and the desert coasts of Peru. One culture, the Nazca, is today particularly famous for vast figures traced in the desert, depicting animals and geometric shapes, whose purpose is unknown. The Arawak-speaking peoples are now spread across a vast portion of northern South America. However, their widely-dispersed fortified settlements and warlike chiefdoms exist side-by-side with many smaller groups of mobile hunter-gatherers, who often raid the crops of the settled farmers. The past centuries have seen a new, highly influential culture has now appeared along the Pacific coast, the Moche. This is the most sophisticated culture so far to appear in South America. In Amazonia, the Arawak-speaking diaspora continues, and will shortly reach its widest expanse. In many places a new phase is beginning, as newcomers and local peoples began to merge and form regionally-rooted societies. Early examples of complex regional societies are emerging at this time in the mountains and plains of the north-west, probably receiving some influences from the advanced civilizations of the high Andes. The past centuries have seen both the Moche and Nazca civilizations are reaching their peak. Elsewhere in the continent, the Arawak-speaking diaspora has now more or less reached its limits. In Amazonia, large, densely populated regional chiefdoms are now established on the floodplains of the great rivers of the region. At the Amazon’s vast mouth, on the island of Marajo, a flourishing culture has emerged, which will last until the final period of Pre-Columbian America. This culture is known for its beautiful multicoloured ceramics, and for the large platform mounds it constructs. The past two centuries have seen the Moche and Nazca civilizations vanish in the Andes region, to be replaced by two empires which now dominate much of the central and southern Andes and parts of coast. These empires – centred on the cities of Tiwanaku and Wari – share a single art style, which suggests they also shared a common religion. The mound-building cultures of lower Amazonia are at their height around now, although some of the mounds will be used for ceremonial purposes for centuries to come. In the central Amazon, the large, well-populated regional chiefdoms shared in intensifying systems of trade and cultural exchange. Items such as precious stones, metals, ceramics and other objects were exchanged over a wide area. This is also apparent in the rise of a unified decorative pottery style throughout the region, called the Amazonian Polychrome Tradition, which spread from the Amazon’s mouth as far as Peru. In the Andes region, the Wari and Tiwanaku empires continue to flourish, but a third power, located on the northern Pacific coast, is growing. This is the kingdom of Chimor, centred on the impressive city of Chan-Chan. In the Amazonian region, full-blown chiefdoms – quite possibly even well-organized kingdoms, now cover much of the region. There is a fairly dense pattern of settlements throughout the region, with sites separated by only a few kilometres. At least one of these settlements, Santarem, seems to have been a very large town covering several square miles, as large as such Pre-Columbian cities as Chan-Chan, Teotihuacan and Cahokia. Over the past two centuries, the Huari and Tiwanaku kingdoms have vanished. The Chimu empire has become the leading state in the Andean region. It is a highly centralized empire, with a well-developed road network spreading out from its imposing capital, Chan-Chan, and extensive irrigation and drainage systems. It is, in fact, developing many of the imperial policies which the Incas, who at this time form a small kingdom in the High Andes, will later take over and extend throughout a much vaster area. In the arts, the Chimu use highly developed techniques in metal working, textiles and the mass-production of pottery. In Amazonia, several large towns and cities are now flourishing, the centres of powerful kingdoms and extensive trading networks. Their fine ceramics, figurines and jewellery indicate the existence of a class of professional craftsmen serving a cultured urban elite. The past centuries have seen the Chimu empire continue to dominate the northern areas of the Andes civilization. However, a new power is on the rise, that of the Inca. The Inca tribe settled a valley in the High Andes of Peru in around 1200, where they founded their capital, Cuzco. It was not until 1438 that they became a strongly centralized state, but they have now begun their great series of conquests. Meanwhile, the towns and states of central Amazonia continued to be home to complex, hierarchical societies. Well-organized chiefdoms are also to be found on the fringes of the Amazon region, both to north and south. Elsewhere in South America, on the eve of European contact, people live in small farming villages or mobile hunter-gatherer groups, much as they have done for hundreds or thousands of years. During the past two centuries, the peoples of South America have seen vast changes. The Inca conquered the Chimu empire in the 1470’s; and more conquests followed, until they ruled an enormous empire, covering most of western South America. South America’s history was put on a completely different trajectory with Christopher Columbus’ discovery of the Americas in the 1490s. In the decades following European contact, disease, enslavement and land seizure destroyed the advanced civilizations of the continent, both in the Andes and the Amazon regions, sending the surviving inhabitants back to a far simpler social organization. The first catastrophic manifestation of this disaster was the suddenly disintegrated of the great Inca state on the arrival of the Spaniard Francisco Pizzaro in 1532, with his horse-riding, firearms-toting soldiers. Soon much of the continent had come under European – mainly Spanish and Portuguese – rule. The Spanish empire in South America runs from Venezuela in the north to Argentina and Chile in the south. Spanish rule is bolstered by the Catholic Church. Colonial society in the Spanish empire is dominated by the great landowners, descendants of the Conquistadores. The silver mines of Peru, Colombia and Bolivia are the empire’s chief economic asset. On the west coast, neglect by the Portuguese of their Brazilian possessions has led other Europeans, notably the Dutch, to establish their own colonies in the region. Over the past century and a half most regions of Spanish South America have now been brought under the firm control of the Spaniards. Until fairly recently the east coast has remained under-developed; Buenos Aires has been a struggling port, and this region of the continent has been poor and sparsely populated. With the rise of transatlantic trade, however, the fortunes of Buenos Aires and surrounding areas has markedly improved, and the region now forms its own viceroyalty. 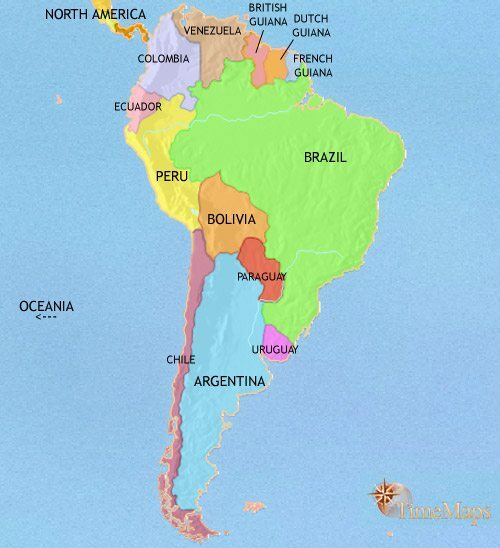 Buenos Aires is now equal in status with Lima, in Peru, and Mexico City, in Mexico, as a Spanish American capital. By this date, racial categorization in Spanish South America is breaking down, with people of mixed descent filling all but the very highest positions in society. The Spanish government’s habit of placing most of the top colonial offices in the hands of European-born officials is a source of growing resentment amongst members of the locally-born elite, the great majority of whom are by now creoles. In the Portuguese empire, Brazil’s sugar exports have been losing out to those of the British and French Caribbean, but coffee-growing is becoming more important to the economy. This, plus the mining in the region, has turned the south of the country into the wealthiest part, with Rio de Janeiro as Brazil’s chief city and seat of government. In the past decades, most South American countries have been unable to achieve political stability, and are ruled by a succession of caudillos. In many places, this instability is compounded by strife between liberal and conservative factions. It is hardly surprising that most South American governments fail to solve problems of economic stagnation and chronic poverty. There are exceptions to this discouraging picture. Both Chile and Argentina have made steady economic progress, and both have experienced large-scale immigration from Europe. In Portuguese-speaking South America, Emperor Pedro II has ruled Brazil for the past 40 years, and under him the huge country has known great economic progress. During the past decades, military dictatorships, factional strife, civil wars and growing inequality have all hampered South American countries from fulfilling their potential. This is by no means the whole picture, however. In Argentina, Uruguay and Brazil there are moves towards more democracy; in Brazil’s case, the country has exiled its emperor (1891) and become a federal republic with a constitution modelled on that of the USA. 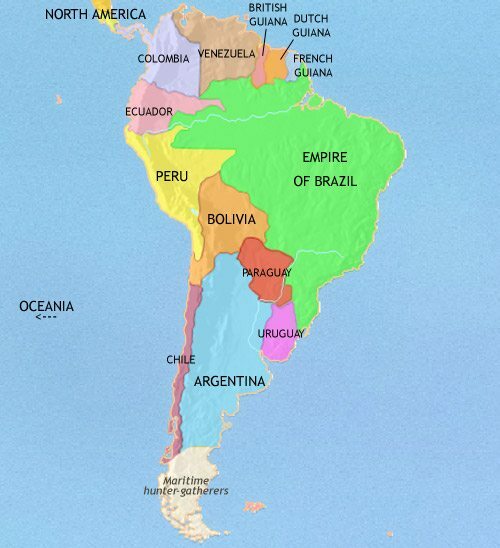 The late 19th century and early 20th century were years of strong economic expansion for Brazil, Argentina and Chile. The development of steamships and refrigeration has opened up European markets to the cattle ranchers of the Argentine Pampas, and Chile has enjoyed a nitrate boom since the 1860’s (this brought it to war with its neighbours, Peru and Colombia, which Chile won). All three countries have attracted heavy investment from Europe (above all Britain) and, later, the USA. Argentina in particular continues to attract mass immigration: over two million Italians, Spaniards and other Europeans (including a Welsh colony) settle in the country to participate in its new prosperity. The recent decades have seen most South American countries stand aloof from the great events of the 20th century. Most remained neutral during World War 1, and played little part in World War 2. The immediate post-World War 1 period was a boom time, as the demand for consumer goods in Europe and America fuelled exports. The notable exception to this was Chile, where the nitrate boom came to a sudden end, leading to severe economic contraction. The sharp economic downturn of the 1930s hit South American countries hard. This led to the rise of populist figures like Colonel Peron in Argentina (president 1946-55, his popularity bolstered by that of his wife, Eva), and in many other countries, dictatorships. Some of these, like Brazil’s, presided over economic recovery; others, in Peru and Colombia for example, were unable to establish political stability and the conditions in which the economic and social problems they faced could be dealt with properly. Uruguay has stood out as a country admired throughout the world for its democracy and prosperity. Depressed prices for many of South America’s exports in the 1960’s and 70’s led to economic and political problems. Military dictatorships seized power in several countries, including Brazil (1964), Argentina (1976), Chile (1973) and Uruguay (1973). In the following decade, however, the tide turned and, despite continuing economic volatility, democratic government was restored in Brazil (1985), Argentina (1983), Chile (1988) and several other countries at about the same time. In 1993, democracy came to Paraguay for the first time in its history. Economic problems have plagued most South American countries at some time during these decades, largely due to their reliance upon a small range of export commodities. However, economic reforms in some countries – notably Brazil and Chile – have led to significant and enduring economic gains. The countries which have missed out on prosperity most dramatically have been those experiencing widespread terrorist activity, such as Peru, Colombia and Ecuador. In two of these, Peru and Ecuador, the insurgencies have been largely defeated, but Colombia’s remains very much alive (as of 2005).